empyre pro 200 first impressions! Re: empyre pro 200 first impressions! Now you're making me nervous even more, one brand new unit that leaks already and they agreed to replace another without knowing for sure it's leaking, basically you're telling me i can expect my unit to leak anytime, thanks. so you're telling me they are no good, i know that now especially when it comes time to honour your name. Yeah right , they are gonna replace a brand new unit without knowing for sure it's leaking but they won't replace a $100 thermostat on my furnace that got damaged by snow getting in the top corner twice already. Really i know you're not telling the truth, even my dealer told me that they don't cover anything and to replace a unit without making sure it leaks(between 9k to10k) yeah right. As for replacing the unit, hahaha, they will try to weld it first i can assure you of that. while were at it, its not like empyre lost a 9k dollar unit. Since they already had a truck there, those will be brought back and updated, they didntnlose nothing but made some really good business decisions. To update the stoce that was basicallly new would be an easy task, I think anyone would be glad to see someone be proactive in a situation like that. I wouldn't call Scott a liar. He has been very honest and straight forward on ANY question I had even if I wouldn't or didn't like the awnser. On the cold days I can get away with putting 4 pieces of wood twice a day in it. Still loving the stove. I usually put one big round in it with 3 or 4 splits around that. Burns big dry rounds fine. Only time i've really encountered bridging is with a bunch of big rounds stuffed in. Fire was still going fine just took a steel rod with a swift rake up through the logs and all was good. Def recommend this stove. It just sipps wood! I doubt I will burn 4 cords this year if it stays like this!!!! I have been promised lots of things when buying something before, we'll do this,we'll do that.but once you buy the product you realize they are not true to their word. some of you are dealers and salesmen and everyone knows when promised good warranty and service it's not always there. there was nothing wrong with that thermostat. It broke because of a defect in the unit. The unit is not properly sealed and this is what keeps frying the thermostat. It clearly state on the unit "outside wood furnace" , you should expect you can keep it OUTSIDE. empyre is hiding behind the 1 year warranty on electronics components when it's not the issue. THE DEFECT OF THE UNIT IS THE PROBLEM. Anyway i just want people to know that empyre does NOT stand behind their product and they just hide behind warranty rules that don't apply. I have a small business and stand behind my product. When i realize i screw up i fix the problem at my own expense so does a lot of other business owners. trying to post some pics bear with me. Thanks Willie it worked! Pics were right before we moved in but stove was up and running. I did change the pex alittle in the basement and cleaned some of that mess up lol. Also have alot more wood I'll try and get a pics today. Got to clean the stove out anyways. Looks great! I am sure you will love it. My 400 has been running great so far. Here is a picture of my set up from the house. 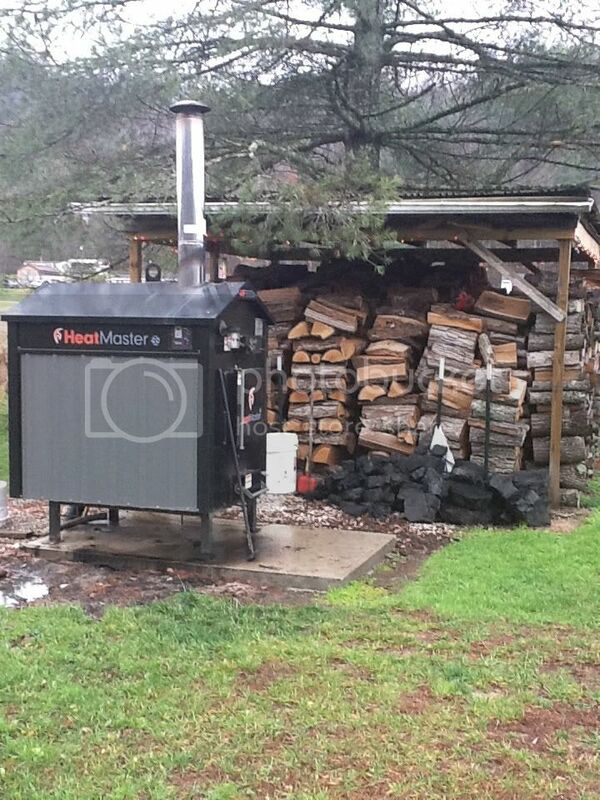 My future wood shed is in the back of the boiler where you can see the wood stacked. I think it will be 12 x 16. Thats awesome. Alittle up date. Today i got a couple more pics of my wood pile and my wood haulin toy I waited two weeks to clean the tubes this time. It wasn't bad at all. Bought a ash vaccum and that thing was awesome. Stuck the hose in the end of the tubes after I put the cleaning rod through and it sucked alot of the loose stuff out! The last pic was after I got back in the house. The stove has a fire going inside but you can't even tell because it doesn't smoke!!!! The thumb on the backhoe is AMAZING for cutting logs and skidding logs out of the woods. IMHO only way to cut and split wood! Im pretty fortunate to be 28 years old and have some awesome toys! Nice tractor that sure makes things easy. I have to clean the boiler tomorrow. It is supposed to be in the 30's so will be a good day to do it. It has been super cold here this past week. Last night we were at -10. Do you ever have problems with bridging. I seem to have it happen fairly often. If I just let it go it will eventually burn down but the blower has to run for a long time to get it to that point. How often do you clean yours belknap? The ash vac was awesome for the tubes. To be honest I think it would be almost impossible to bridge the 200. I have honestly perposely tried 4 times stacking wood in the boiler with rounds/splits of all different sizes. I stacked it like you would stack the ends of your wood piles and all and would come back home from work after 12 hours and it was fine. Every once in a awhile the wood would stick off the bottom alittle but still would burn with no problem and then like you said would always fall. I guess that would be classified as bridging but not to wear I would be scared of the fire going out. I usually take the rod for the gasser chamber and go up through the middle of the wood when reloading. Its not necessary but like messin with the boiler alot. I bet I went down there 4 times today just to look inside lol. I clean mine every 2 weeks. I bought a ash vac and it does work well. I also bought the cleaning tool for the tubes that you use with a drill and that works great. It sure makes cleaning a whole lot easier. One thing about loading the boiler that someone else said was if you load the largest round first in the middle then put smaller stuff on either side and then the next row put the largest round in the middle again and small stuff on the sides it should burn down a little better. I am going to give this a try. And that's exactly why you'll stay a small business, notice how many big companies run wild then go bankrupt and reopen under new name doing same thing. We had a builder do this here for 98.2 million, less than a year later he was back developing and building again. Unfortunately his multimillion dollar bankruptcy killed 31 of our communities biggest contractors and suppliers. Vacant buildings no jobs and lots of people left. I think you are beating a dead horse now, there are much better ways to spread your story and in a much more credible way. Your not alone with an Empyre horror story, there's lots out there and from what I've read, you got off REAL lucky with just a stat. If I were you I think I would post detailed pics of your problem and the solution to help others prevent another story like yours. I think its best to help keep these boilers in top shape and helping others is the only way to do that. Coming up with ideas and contributing will get you more Milage and help other owners too. I hope for ec33's sake he never has a problem like many others have. Looks like he's got a great thing going with some sweet toys too. I like all the pics, and yes he has to clean up dat der pex. Mount that stuff to some nice plywood and label......hahahaa you don't hear a lot of good stories like his,cuz the net is about a lot of whiners and complainers , when they have problems. Not many go out of their way to post up how great everything is, so thanks for the good thread ecc33. Keep the pics coming, can never have enough. Thanks for the kind words! I'll get pics of my saw and dad and my wood splitter. I never thought to say that about the bridging deal but I have been putting two decent size rounds in the bottom and splits on top for some time now. That nets me my best burn times and has no bridge effect at all. Maybe I'll get a pic of me loading the stove tommorrow also!